This movie, based on images taken by ESA's Mars Express, showcases the 102 km wide Neukum Crater in the southern hemisphere of Mars. 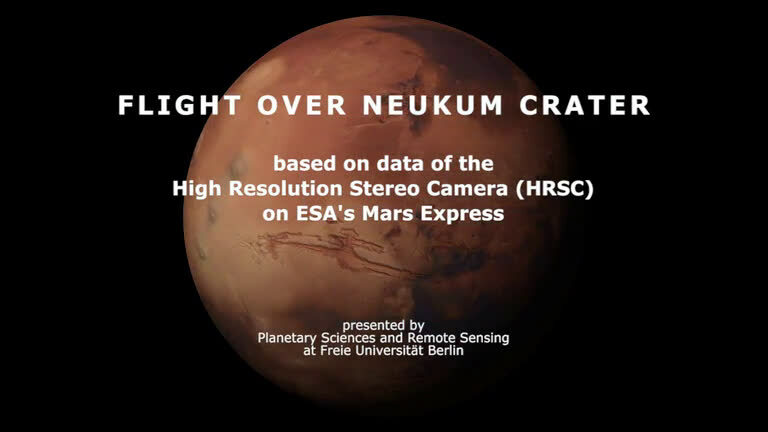 The crater is named for the German physicist and planetary scientist, Gerhard Neukum, one of the founders of ESA's Mars Express mission who inspired and led the development of the high-resolution stereo camera on Mars Express. The crater's shallow interior has been infilled by sediments over its history. It is also marked with two irregular depressions that may be a sign of a weaker material that has since eroded away, leaving behind some islands of more resistant material.